As prominent economists sound the death knell for cryptocurrencies and technical analysts label the current events as part of the bottoming process, investors have one question in mind. Are cryptocurrencies nearly prepped for a turnaround or is this the next leg down in a 7-month bear market? Cryptocurrencies continue to waver and fumble as a few prominent world economists forecast that governments will regulate bitcoin to death. Meanwhile, other experts predict that bitcoin will become a mainstream means of payment within the next decade. 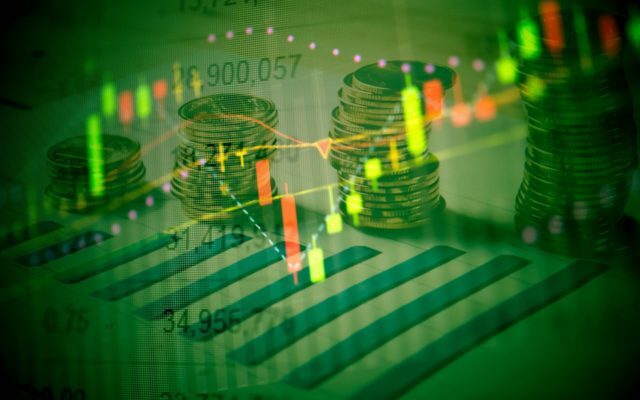 To date, droves of cryptocurrency investors are still wondering exactly where the much-hyped institutional investors are and, while positive weekly developments demonstrate that the platform for institutional investors is being constructed, these events appear to be having minimal impact on cryptocurrency prices. In other news, the Bancor hack and failure of Bitcoin to stay above $6,750 appears to be dragging the entire cryptocurrency market to new lows, yet analysts and retail investors have spent the start of the week labeling the current technical setup as the bottoming for most cryptocurrencies. Let’s have a look at the charts to see what’s happening. 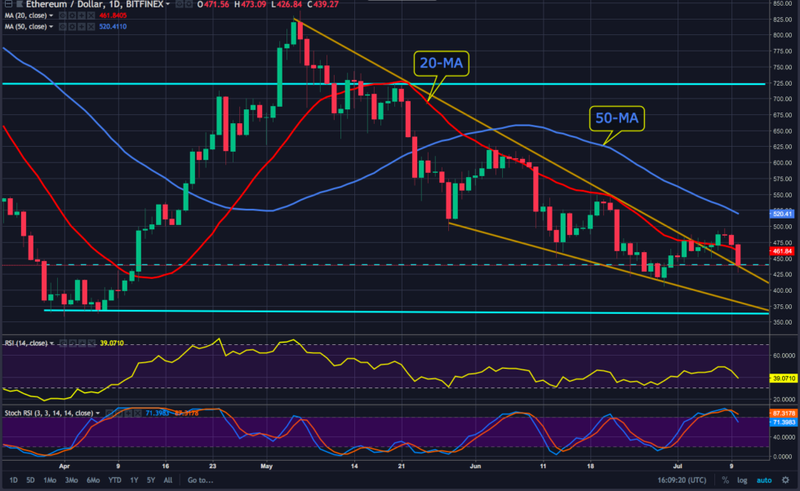 After two days of trading outside the descending channel, ETH managed to pop above $500 for the first time in more than two weeks. 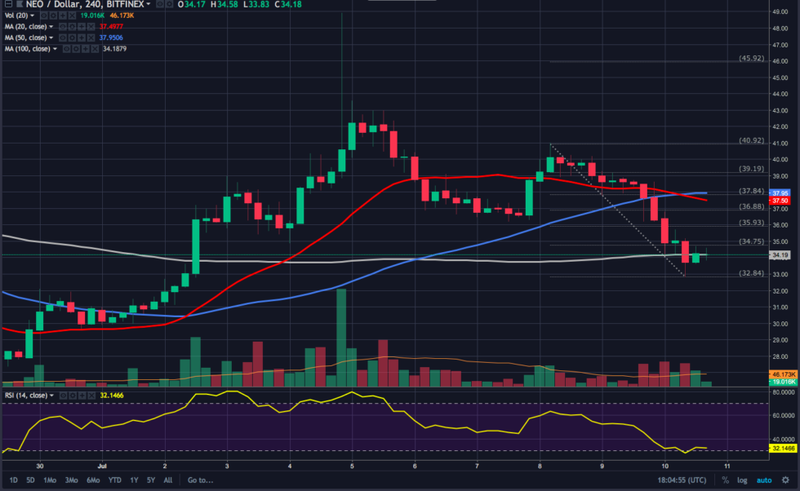 Unfortunately, the Bancor hack and Bitcoin pullback appear to have directly impacted ETH’s momentum as it dropped below the 20 and 50-day MA and back into the descending channel. At the time of this writing, ETH is down 10% and the daily chart shows the Stoch sharply descending from nearly overbought territory whereas the RSI dips into the bearish zone at 38. ETH now trades below the $450 support and could drop as low as the $400 – $420 area which was a June low. Below this point, ETH has support at $380 and $360. After pulling back from an impressive 20%+ rally last week, NEO now rests on the 20-day MA at $34.25 and the RSI on the 4hr chart shows the cryptocurrency attempting a turn around at 32 which has proven to be a zone where this particular altcoin stages a reversal. Over the last few days, NEO has done the tango with the 50% Fib retracement level ($41 – $36.33) and the technical setup suggests a further decline in the near term. $33.66 serves as the most immediate support and at press time, NEO is holding above the 20-MA as interest in NEO appears to be increasing. EOS has taken quite a hit, down 13.18% at $7.39. 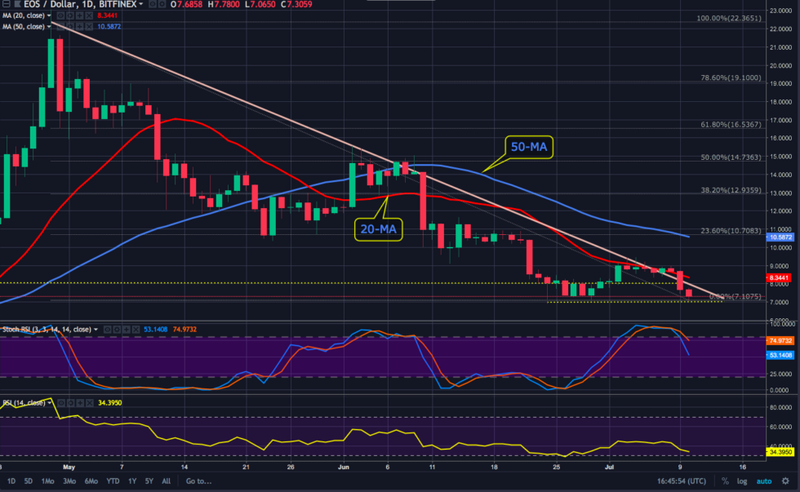 EOS trades far below the 20 and 50-MA and currently rests on the $7.37 support followed by a softer support at $7. Failure to hold above $7 could see EOS drop as low as $4 where buyers are likely to show strong interest. At the time of this writing, the RSI dips into the oversold region, and the Stoch had turned downwards with plenty of room to go which suggests further selling. In the event of a price reversal, EOS will encounter strong resistance at $9 where it previously struggled to overcome the descending trendline. Following the direction of other altcoins, Cardano (ADA) is also down 9.42% today and currently trades at $0.129 which is below the $0.1350 support. The closest support after this is $0.1253. The 4-hour chart shows both the Stoch and RSI beginning to reverse to possibly rise from oversold territory as ADA has aroused purchasing interest below $0.13. As Bitcoin continues to fall, ADA could drop as far as $0.11 which would be a good point to open a position as ADA should recover to the $0.15 resistance with ease once the current clouds clear up. At the moment, XRP is suffering as it has finally fallen below the all-important $0.45 support and is down 5.90% for the day. Both the 20 and 50-day MA are below the 100 MA suggesting further decline as the most likely outcome. 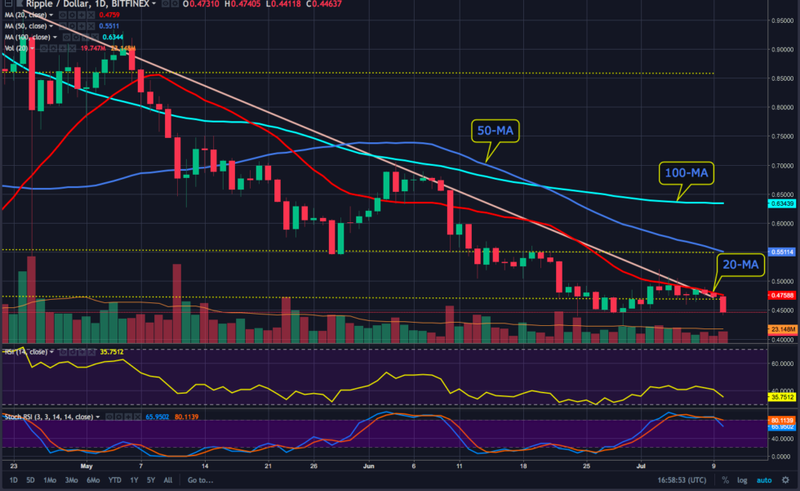 Yesterday’s drop from $0.48 pushed XRP below the 61.8% Fib retracement level, along with the $0.47 support and the cryptocurrency closed below the 100-day MA. 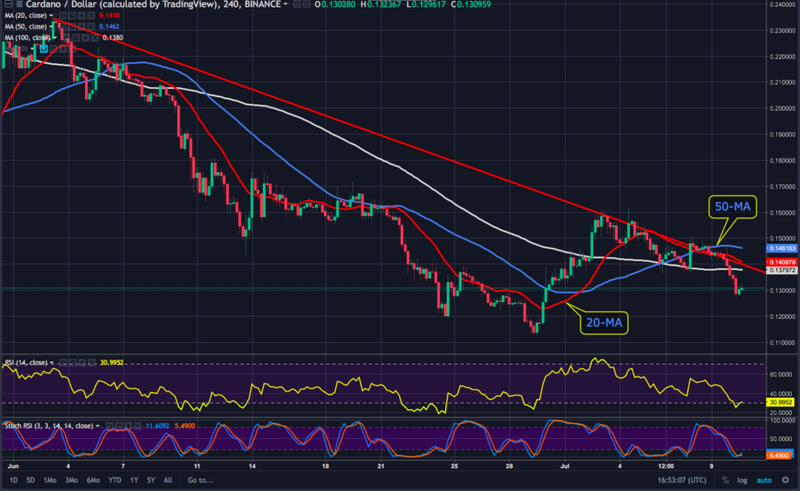 At the moment, both the RSI and Stoch are in bearish territory and for the time being, we do not see any entry points that provide an attractive risk-reward scenario as XRP has failed to attract buying interest even below $0.45. Where do you think altcoin prices will go this week? Let us know in the comments below! The post Ethereum Price Analysis – Plus NEO, EOS, ADA, XRP appeared first on Bitcoinist.com.